Modern workforces are changing, and most office jobs allow employees to work from anywhere with an internet connection, whether that’s from their home, a cafe near the main office or a workspace on the other side of the country. But engaging remote employees can also be difficult when they’re separate from the rest of the team. Luckily, companies can use video platforms to more effectively engage their remote employees. Some options for engaging remote employees through a company video platform include providing company updates and CEO messages through video. Companies can also allow employees to upload their own relevant content a video platform for presentations and other projects. Training videos, while often crucial for training remote employees, may not be as engaging or effective as you’d like them to be when those employees aren’t in the office to ask questions or share updates on progress. To ensure employees are getting the most out of the videos and actually retaining the material being presented, you can use video quizzing to gauge understanding. Ensemble Video’s quizzing feature, available in the new version 5.0, allows trainers to easily create and publish quizzes on top of their videos. They can create multiple choice, multiple select and/or true false questions to ensure employee understanding. Quizzes can also include hints and explanations for each question to facilitate the training process. Feeling disconnected from leadership and a collaborative office can be detrimental to morale. If your remote employees feel engaged with the company and its leadership, they’re more likely to do better work and feel happier doing it. A company video platform is a great tool for engaging remote employees with company updates, messages that celebrate the work of the entire team and even personal messages from leadership about company-wide changes and how all employees –– even the remote ones –– play a role in those changes. Remote employees may have presentations and other projects to share with the team in the main office, and with a company video platform, your remote employees have an easy, secure place to upload that content. 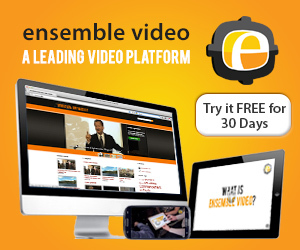 With Ensemble Video, you can use our video Dropbox feature to quickly and easily collect those videos. Ensure the platform you use allows adaptive bitrate streaming, so no matter what a remote employee’s internet connection is like, they’ll be able to watch videos at the highest quality available. Implement a company video platform that uses HTML5 so it will be accessible on all devices and employees can slow down or speed up videos to their own viewing preferences. If your company self-hosts your video platform, your remote employees may have to connect to a VPN to access its content. Explore whether Ensemble Video’s enterprise video platform is right for your company when engaging remote employees. You can request a free trial today and get started testing out our full suite of features.